JACK TRUMPED: A smiling Jack Warner leaves the Hall of Justice, Port of Spain yesterday after losing an appeal for judicial review. Extradition proceedings can now go ahead against the former minister and FIFA vice president. 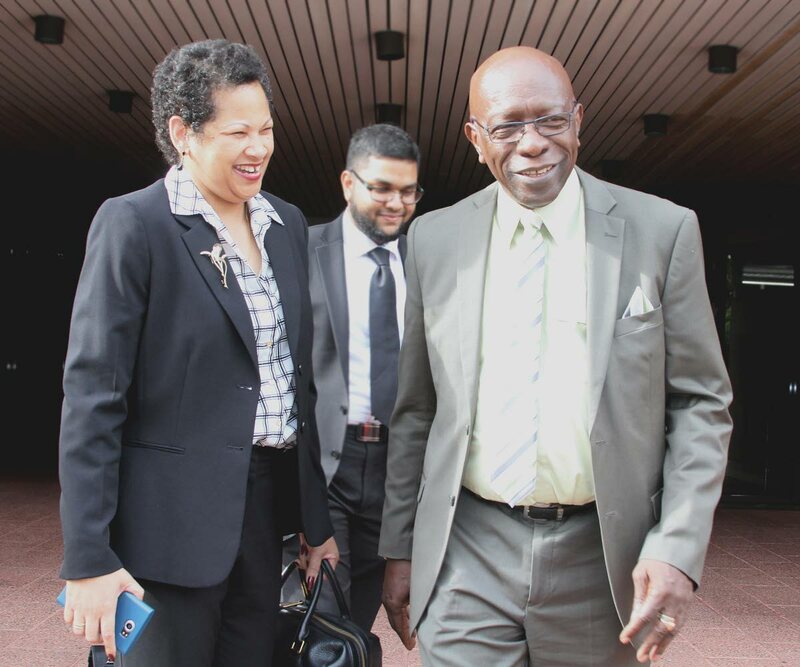 Extradition proceedings against former FIFA vice president Jack Warner can proceed as a High Court judge has dismissed his judicial review claim challenging his extradition to that country. Justice James Aboud yesterday dismissed Warner’s lawsuit but has extended a stay of the magisterial proceedings for 28 days to give the former minister’s legal team an opportunity to appeal his ruling. The committal proceedings which began against Warner in the Port of Spain Magistrates’ Court are expected to come up for hearing today. Warner surrendered himself to Fraud Squad officers on May 27, 2015, after learning of the provisional warrant. He is currently on $2.5 million bail. His lawsuit challenged the process by which the extradition proceedings against him are being carried out and seeks to quash the Authority to Proceed (ATP) which was signed in 2016 by Attorney General Faris Al-Rawi. The ATP gave the magistrate the green light to begin committal proceedings. Warner also challenged the legality of the Extradition (Commonwealth and Foreign Territories) Act, and the treaty signed between this country and the United States. He is wanted in the United States for a series of fraud-related offences allegedly committed during his tenure as vice-president of world football’s governing body FIFA. In his 50-page written ruling yesterday, Aboud held that if a Warrant of Extradition was to be signed following the extradition proceedings, it will be in accordance with domestic law and not the treaty. He held that both the AG and the magistrate would be mindful of that and even if they failed to do so their decisions are reviewable by the courts. Senior Counsel Douglas Mendes appeared for the AG along with Michael Quamina while Fyard Hosein,SC, Rishi Dass, Sasha Bridgemohansingh and Anil Maraj represented Warner. Reply to "Extradition to proceed as Warner loses in court"